It is a frigid Wednesday night in January and Thunder Bay’s city council has gathered for what promises to be a marathon session that will include debate, negotiation and an ardent appeal. As the temperature outside dips to minus 30, the 13 councillors inside will have to decide how they are going to divvy up the city’s annual budget of $360-million. But before they can turn to approving or rejecting such prosaic expenses as pool maintenance and sidewalk construction, there is a “deferred item” of business that demands to be faced. Police Chief Sylvie Hauth has returned to council chambers, for the second time this month, to repeat her request for an additional $1.1-million in funding for her force of about 220 sworn officers. Thunder Bay Police Chief Sylvie Hauth. In some ways, hers is the kind of overture made to countless councils across the country every year: A police chief arrives on bended knee, asking for dispensation, and a skeptical council and mayor ask tough questions in return. But in this sprawling frontier community perched at the northernmost tip of Lake Superior, the plea for additional cash has both an unusual provenance and a purpose that, in some quarters here, is not an easy sell. Chief Hauth has found herself before council in the wake of a series of external investigations, including a 2015 Ontario coroner’s inquest into the deaths of seven young First Nations people in the city; an Ontario independent police review, released last December, which found the Thunder Bay police force to be racist at an “institutional level”; and a report, released two days after that, by Senator Murray Sinclair, in which he pilloried the city’s police board for failing Indigenous people who are the targets of hate crime. Tonight, in this chamber on whose walls hang Indigenous art and a portrait of the Queen, Mayor Bill Mauro appears unmoved by Ms. Hauth’s request. Just two weeks earlier, in this same setting, he had told her that he was not inclined to throw his weight behind green-lighting the additional money, and he asked her to scour her existing budget for the cash. Perhaps, he offered, she could pare back the ranks of her civilian staff. Mayor Mauro opens the debate over Chief Hauth’s renewed appeal by telling her that he had been “very surprised” when, only a day after her previous entreaty to council, she had written to say she would be budging not a single penny from her original request. Ms. Hauth, a 25-year member of the Thunder Bay Police Service, is prepared for the volley. Any possible cuts, she says calmly, were made months ago; any efficiencies have been found. She needs money to put cameras on officers and their vehicles, in order to provide video records of interactions with the public. She needs to put name tags on officers so they can be identified by citizens. She needs to create a peer-review process to ensure that cases are investigated properly. And she desperately needs to add five officers to her criminal-investigations branch, which is understaffed and undertrained. It is not only external investigations that have laid bare the challenges she faces. So have the numbers. For two years running, Thunder Bay has had the highest murder rate in the country, far outpacing major centres such as Toronto, Montreal and Vancouver. In 2017, seven people were murdered in this city of more than 100,000; six of the victims were Indigenous. In 2018, the number of homicides climbed to eight, their races not yet revealed by Statistics Canada. Almost three of every 10 hate crimes committed against Indigenous people in Canada happen here in Thunder Bay, where Indigenous people account for 13 per cent of the population. But this city is not the only place in Canada where Indigenous people are at risk of violence. Across the country, to take the most extreme example of violent crime, about a quarter of all homicide victims are Indigenous, even though less than 5 per cent are First Nations, Inuit or Métis. There is, in these council chambers, a particular urgency to the conversation about systemic racism against Indigenous people in Canada – the extent to which it exists and how it can best be faced and surmounted. What happens at city hall tonight, and in the months to come, has implications not only for Thunder Bay but also for the country. How the city’s leaders and its residents respond could help shape the future of reconciliation in Canada. Thunder Bay City Hall, a concrete-block structure with a gleaming glass façade, looks out onto a carved-stone war memorial on which stands a statue of a mournful soldier looking downward. It opened in 1966 to serve the city of Fort William and, when that city merged with Port Arthur four years later into what is now Thunder Bay, the building became the headquarters for the amalgamated municipality. Today it sits at the very heart of Thunder Bay’s South Core neighbourhood, one of the most downtrodden parts of the city. Not a block away, the windows of a tall white apartment tower are mostly covered in makeshift cuttings of cardboard or tin foil; in the next building several windows are shattered. Although officially united, the former cities of Fort William and Port Arthur remain divided by the Neebing-McIntyre Floodway – and, just as palpably, by a wide socioeconomic expanse. Port Arthur boasts Lakehead University, with its striking modern campus and faculties of education, medicine and law. Its downtown is home to restored heritage buildings, running and cycling trails, live theatre and hopping bars that serve local craft beer. Port Arthur’s shoreline affords a sweeping view of the Sleeping Giant, a mass of ancient rock that stretches into Lake Superior and that the Ojibwa call Nanabijou, the Spirit of the Deep Sea Water. Fort William, although not without handsome older residential districts and streets of tidy wartime homes, is a tougher, poorer place to live. In the roughest section, it is not uncommon to catch sight of people huddled in the boarded-up doorways of long-vacant stores, holding liquor bottles in paper bags. Report finds ‘systemic racism’ at police service in Thunder Bay, Ont. On one long Fort William street of shops and garages sits the workaday Salsbury Grill. Known colloquially as the Sal, it is crowded and noisy with the clatter of plates, boisterous conversation and music blaring from a speaker on the wall. As she sits talking with a reporter, no one in the Sal turns to notice when the tears begin to well in Joyce Hunter’s eyes. Ms. Hunter, who is Omushkego (Cree), is recounting the story of the final night in the life of her late cousin, 25-year-old Marlan Chookomolin. She is remembering what it was like to watch the carotid artery in his neck, still beating, strong and stubborn, when she first arrived at the hospital where he had been taken. Marlan had been found unconscious on a walkway behind a local hotel shortly after midnight on June 25, 2017 – close to the place where a woman was found dead earlier this week. Doctors kept him breathing long enough for his mother and a group of other family members to arrive from the fly-in community of Peawanuck, so they could be with him as he died. Ms. Hunter remembers the nurses coming into the hospital room to remove the equipment that was keeping him alive. She remembers watching Marlan’s pulse grow weaker, and then watching it finally disappear. She thinks her cousin may have been killed during a tragic escalation of a simple bike theft; Marlan’s bicycle was missing from the scene and he had no other possessions worth taking. But as deep as her grief is over his death, her frustration at the police department’s failure to resolve the case is also profound. “His killers are still here walking around,” she says through her tears, “and nobody knows who they are.” There was little indication over the past two years, Ms. Hunter says, that the police followed up on tips offered by his mother. But, just recently, she says a detective contacted her at the request of Chief Hauth after Ms. Hunter bumped into Celina Reitberger, the new head of the police board. She’d told Ms. Reitberger that leads in Marlan’s case had been ignored. Joyce Hunter visits the site behind the Country Fair shopping centre where her cousin, Marlan Chookomolin, was found clinging to life in June, 2017. The death of Marlan Chookomolin, a young man who had come to Thunder Bay from Peawanuck with ambitions of going to film school, and the mystery that surrounds its investigation, is far from an outlier. A full two years before Marlan’s death, Dr. David Eden, a regional supervising coroner, began an inquest into the deaths of seven young people who had left their homes on First Nation reserves. Five of the seven, who ranged in age from 15 to 18, were found in the McIntyre or the Kaministiquia waterways. Most of them had been living with host families billeting them in this city far from their own communities, which had no high schools of their own. The inquest’s jurors heard about the isolation the students felt. They heard tales of the drug and alcohol abuse that dogged some of them as they sought to cope with the loneliness and dislocation. After eight months and 146 witnesses, the inquest deemed three of the deaths accidental; the cause of the remaining four were ruled “undetermined.” Parents whose teens fell into the second category were left with little more understanding than they’d had before the inquiry began. Shortly after Dr. Eden’s inquest closed, another investigation was launched – this one aimed squarely at the city’s police force, and conducted by Gerry McNeilly, the Independent Police Review Director for the Province of Ontario, whose office goes by the acronym OIPRD. Gerry McNeilly, Ontario's Independent Police Review Director, waits to present his review of the Thunder Bay Police Service at the DaVinci Centre. Along with the seven student deaths reviewed by Dr. Eden’s inquest, Mr. McNeilly and his office examined 37 police investigations of sudden deaths in the city going back to 2009, conducting interviews with current and former officers and holding more than 80 meetings with Indigenous leaders. His report, released this past December, was scathing. 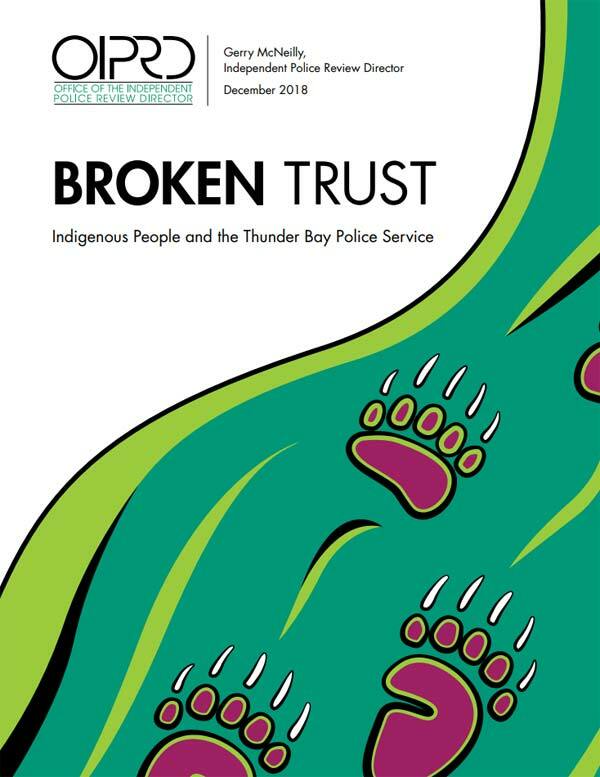 Its title alone spoke volumes: Broken Trust – Indigenous People and the Thunder Bay Police Service. It determined, among other things, that officers had repeatedly relied on generalized notions about how Indigenous people likely came to their deaths, and that they then acted, or refrained from acting, based on those biases. Repeatedly, it found, officers failed to learn the results of autopsies that might have provided crucial clues to identifying perpetrators, and they failed to share what might have been vital information with other forces. 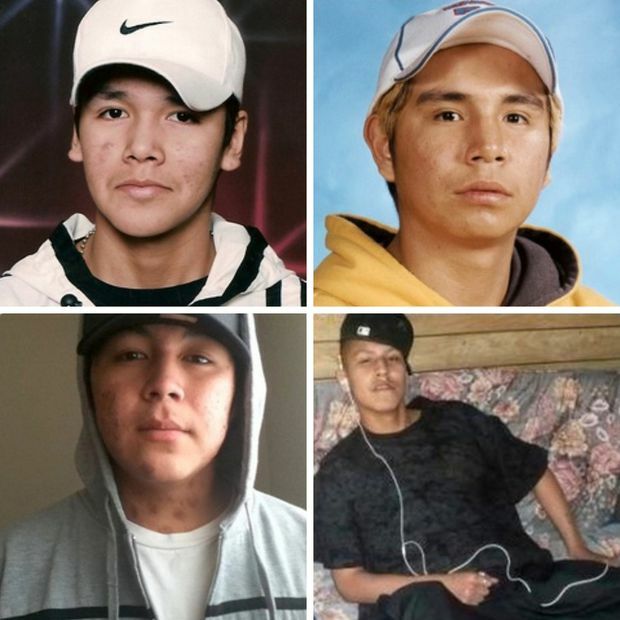 Four Thunder Bay students whose deaths were examined during a coroner's inquest. Clockwise from top left: Jethro Anderson, 15, Curran Strang, 18, Kyle Morrisseau, 17, and Jordan Wabasse, 15. Jethro Anderson, 15, from Kasabonika Lake First Nation, and who had spoken only Oji-Cree until Grade 7, disappeared on Oct. 28, 2000. Although there was bruising on his body and reports that he had been beaten, the police quickly issued a statement saying no foul play was suspected. The coroner found his cause of death to be undetermined. Curran Strang, 18, from Pikangikum First Nation, was reported missing on Sept. 22, 2005. When his body was found four days later, face down in the McIntyre River, he had no shirt or socks on, and, although his pants were up, they were undone. An autopsy revealed a high blood-alcohol level and red marks on his shins. After a limited investigation, the police declared there to have been no foul play. His death was ruled an accident by the coroner’s jury. Kyle Morrisseau, 17, from Keewaywin First Nation, and a grandson of Ojibwa painter Norval Morrisseau, was last seen alive on Oct. 31, 2009. There were suggestions he had been killed over a drug debt. When his body was pulled from the McIntyre Floodway on Nov. 10 of the same year, there was an abrasion on the left side of his nose, and his face appeared swollen. In his report, Mr. McNeilly found that the police had ignored many of the tips they were given about his case. The coroner ruled his death to be an accident. Jordan Wabasse, 15, from Webequie First Nation, and a star hockey player, was reported missing on Feb. 8, 2011. His body was not found until the following May 10. There were multiple witnesses who said he had been the victim of mistaken identity on the part of those who killed him, and that he had been thrown off a bridge by members of the Native Syndicate street gang, who wanted another man for drug debts. The police did suspect foul play at the time, but leads were not checked, the OIPRD found. The coroner ruled the cause of death as undetermined. Nine of the TBPS sudden death investigations that the OIPRD reviewed are so problematic I recommend these cases be reinvestigated. A multi-discipline investigation team should be established to undertake, at a minimum, the reinvestigation of the deaths of the nine Indigenous people identified. The multi-discipline investigative team should establish a protocol for determining whether other TBPS sudden death investigations should be reinvestigated. The multi-discipline investigation team should also assess whether the death of Stacy DeBungee should be reinvestigated, based on our Investigative Report and the Ontario Provincial Police review of the TBPS investigation. The team should also assess when and how the investigation should take place, without prejudicing ongoing Police Services Act proceedings. TBPS should initiate an external peer-review process for at least three years following the release of this report. TBPS should immediately ensure sufficient staffing in its General Investigation Unit in the Criminal Investigations Branch. Adequate resources must be made available to enable this recommendation to be implemented on an urgent basis. TBPS should establish a Major Crimes Unit – within the Criminal Investigations Branch – that complies with provincial standards and best practices in how it investigates serious cases, including homicides, sudden deaths and complex cases. TBPS should provide officers, who have taken the appropriate training with opportunities to be assigned to work with Criminal Investigations Branch and the Major Crimes Unit investigators to gain experience. TBPS should develop a formalized plan or protocol for training and mentoring officers assigned to Criminal Investigations Branch and the Major Crimes Unit. TBPS should develop a strategic human resources succession plan to ensure the General Investigations Unit, Criminal Investigations Branch and the Major Crime Unit is never without officers who are experienced in investigations. TBPS should establish procedures to ensure occurrence or supplementary reports relevant to an investigation are brought to the attention of the lead investigator or case manager. This must take place regardless of whether a case has been earmarked for Major Case Management. TBPS should develop procedures to ensure forensic identification officers are provided with the information necessary to do their work effectively. TBPS should immediately improve how it employs, structures and integrates its investigation file management system, Major Case Management system and its Niche database. TBPS should, on a priority basis, establish protocols with other police services in the region, including Nishnawbe-Aski Police Service and Anishinabek Police Service to enhance information-sharing. TBPS should fully integrate the Aboriginal Liaison Unit’s role into additional areas of the police service. This would help to promote respectful relationships between TBPS and the Indigenous people it serves. TBPS should increase the number of officers in the Aboriginal Liaison Unit by at least three additional officers. With Indigenous engagement and advice, TBPS should take measures to acknowledge Indigenous culture inside headquarters or immediately outside it. Thunder Bay Police Service should make wearing name tags on the front of their uniforms mandatory for all officers in the service. TBPS should implement the use of in-car cameras and body-worn cameras. TBPS should, through policy, impose and reinforce a positive duty on all officer to disclose potential evidence of police misconduct. I urge the Ontario government to bring into force Schedule 7, the Missing Persons Act, 2018, as soon as possible. 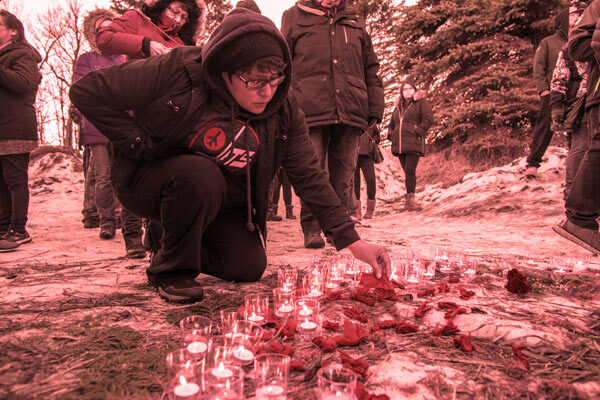 TBPS and the Thunder Bay Police Services Board should re-evaluate their missing persons policies, procedures and practices upon review of the report of the National Inquiry into Missing and Murdered Indigenous Women and Girls, due to be released on or before April 30, 2019. TBPS and the Thunder Bay Police Services Board should re-evaluate their missing persons policies, procedures and practices upon review of the Honourable Gloria Epstein’s report on Toronto Police Service’s missing persons investigations due to be released in April 2020. The Office of the Chief Coroner, Ontario’s Chief Forensic Pathologist, the Regional Coroner, and TBPS should implement the Thunder Bay Death Investigations Framework on a priority basis and should evaluate and modify it as required, with the input of the parties, annually. The Office of the Chief Coroner should ensure police officers and coroners are trained on the framework to promote its effective implementation. The Office of the Chief Coroner and TBPS should publicly report on the ongoing implementation of the framework in a way that does not prejudice ongoing investigations or prosecutions. The Ontario Forensic Pathology Service should train all pathologists on the Intersection of Police and Coroners for Thunder Bay Death Investigations as set out in the framework. TBPS should reflect, in its procedures and training, fundamental principles to define the relationship between investigators and pathologists. The Ontario Forensic Pathology Service should establish a Forensic Pathology Unit in Thunder Bay, ideally housed alongside the Regional Coroner’s Office. If a Forensic Pathology Unit cannot be located in Thunder Bay, TBPS and the Ontario Forensic Pathology Service should establish, on a priority basis, procedures to ensure timely and accurate exchange of information on sudden death and homicide investigations and regular case-conferencing on such cases. The Ontario Forensic Pathology Service should provide autopsy services compatible with cultural norms in Indigenous communities. TBPS should focus proactively on actions to eliminate systemic racism, including removing systemic barriers and the root causes of racial inequities in the service. TBPS should undertake a human rights organizational change strategy and action plan as recommended by the Ontario Human Rights Commission in October 2016. TBPS leadership should publicly and formally acknowledge that racism exists at all levels within the police service and it will not tolerate racist views or actions. TBPS leadership should engage with Indigenous communities on the forum for and content of these acknowledgements. This would be an important step in TBPS advancing reconciliation with Indigenous people. The Thunder Bay Police Services Board should publicly and formally acknowledge racism exists within TBPS and take a leadership role in repairing the relationship between TBPS and Indigenous communities. This too, is an important step in TBPS advancing reconciliation with Indigenous people. TBPS leadership should create a permanent advisory group involving the police chief and Indigenous leadership with a defined mandate, regular meetings and a mechanism for crisis-driven meetings to address racism within TBPS and other issues. Explains how the diversity of Indigenous people and pre and post contact history is relevant to the ongoing work of TBPS officers and employees. For example, Indigenous culture and practices are highly relevant to how officers should serve Indigenous people, conduct missing persons investigations, build trust, accommodate practices associated with the deaths of loved ones and avoid micro-aggressions. Micro-aggressions are daily verbal or non-verbal slights, snubs, or insults thatcommunicate, often inadvertently, derogatory or negative messages to members of vulnerable or marginalized communities. TBPS should ensure the Indigenous cultural competency training recommended in this report is accompanied by initiatives in collaboration with First Nations police services that allow TBPS officers to train or work with First Nations police services and visit remote First Nations to provide outreach. TBPS leadership should provide greater support for voluntarism by attending relevant sporting or community events. TBPS should develop and enhance additional cultural awareness training programs relating to the diverse community it serves. TBPS should implement psychological testing designed to eliminate applicants who have or express racist views and attitudes. In Ontario, such specific testing is not done. It can be tailored to the TBPS experience. This testing should be implemented in Thunder Bay on a priority basis. TBPS should, on a priority basis, create and adopt a proactive strategy to increase diversity within the service, with prominence given to Indigenous candidates. TBPS leadership should link job promotion to demonstrated Indigenous cultural competency. TBPS should report to the OIPRD on the extent to which the recommendations in this report are implemented. This is imperative given the crisis in confidence described in this report. The OIPRD should, in turn, report publicly on TBPS’s response and the extent to which the recommendations in this report are implemented. On an annual basis, TBPS should provide the public with reports that provide data on sudden death investigations. These reports can provide data, in a disaggregated Indigenous and non-Indigenous manner, detailing the total number of sudden death investigations with a breakdown of investigative outcomes, including homicide, accidental death, suicide, natural death and undetermined. The very week that Mr. McNeilly delivered his findings, yet another report was released, this one by Senator Murray Sinclair, the respected First Nations jurist who had presided over the Truth and Reconciliation Commission into the legacy of Canada’s system of state- and church-run Indian residential schools. Chief among his conclusions: The Indigenous people of Thunder Bay had lost confidence in the ability of the city’s police; and, in the face of “unmistakable racism,” there had been an absence of leadership from the Thunder Bay Police Service Board. Mr. Sinclair recommended that the police board be disbanded and put under the control of an outside administrator on an emergency basis; this was, in fact, done on the day his report was released. As sobering as are the findings of each of those inquests and investigations, it is the stories of the victims and their families that resonate most deeply. One of the 37 cases investigated by Mr. McNeilly was that of Christine Gliddy, a 28-year-old mother from Wunnumin Lake First Nation, an Oji-Cree community 360 kilometres northeast of Sioux Lookout. Ms. Gliddy was found unconscious and near death in March, 2016, in the gravel and snow at the south end of a railroad bridge that crossed the McIntyre River. She was wearing a T-shirt and socks, but her pajama pants had been pulled partway down her legs, and her boots and other belongings were scattered nearby. She died a short time later. Her autopsy report listed many injuries. Despite the condition of her body, Mr. McNeilly says the police did not treat Ms. Gliddy’s death as suspicious and they conducted no meaningful investigation; hers is one of the nine cases the OIPRD wants reopened. Ms. Hunter, the cousin of Marlan Chookomolin, says the acknowledgment by Mr. McNeilly and Mr. Sinclair of the racism in Thunder Bay will not, by itself, bring about reconciliation – there must also be a shift in power to level the playing field between Indigenous people and the rest of the city. Celina Reitberger is the first Indigenous chair of the Thunder Bay police board. Women and young people in Thunder Bay have been increasingly outspoken about the need for change: An Ipsos/City of Thunder Bay poll in 2017 found an increasing number of people perceived racism and discrimination to be serious issues compared with two years earlier. On the night of the late-January council meeting, neither the police chief nor the mayor had officially held their jobs for more than a few months. Each arrived at this juncture with a long history in this city. Now 63, Mr. Mauro grew up in Thunder Bay, studied education at Lakehead and worked at both blue-collar jobs and as a teacher before joining city council in 1997. Six years after that, he was elected to sit as a Liberal MPP and held cabinet posts including that of minister of municipal affairs and housing. Four months after losing his seat in last June’s election, he was elected mayor of Thunder Bay. He arrived at city hall at a tumultuous time. “We have really taken a hit in the last number of years,” Mr. Mauro said in an interview in his office last month. Former mayor Keith Hobbs – who is also a 34-year veteran of the Thunder Bay police force – did not run for re-election after being charged, in 2017, with extortion. Mr. Hobbs’s wife, Marisa, and a woman named Mary Voss have also been charged. The three are accused of threatening a former Thunder Bay attorney in an effort to force him to purchase a house for Ms. Voss. Their trial is scheduled for November. Chief Hauth’s office has also seen its share of controversy: She landed in her position after her predecessor, J.P. Levesque, was charged and then found not guilty of obstruction and breach of trust. He had been accused of inappropriately tipping off Mr. Hobbs in December, 2016, that he was being investigated for extortion. Chief Hauth, 52, who assumed her current job in November after serving two stints as acting chief, was born and raised in Iroquois Falls, Ont. Although she once planned to become a lawyer, she could not “make the square peg fit in the round hole.” And so she got a master’s degree in criminology, and then took a job in the provincial correctional facility in Thunder Bay. After being hired as a cadet on the city police force in 1993, she worked her way up, through the ranks of detective and inspector, to become the city’s first female police chief. Although there was some criticism of the police board’s decision to hire internally despite all the controversy swirling around the force, board chair Jackie Dojak said at the time that Ms. Hauth had promised to work with city partners to resolve the “complicated” issues. “We know that the police alone cannot solve these issues. We know that we need partnerships,” said Ms. Dojack, whose term was not renewed – she was succeeded by Ms. Reitberger, a First Nations lawyer who was sworn in just before the release of the McNeilly and Sinclair reports. At the council meeting, all the councillors who speak appear to favour giving Chief Hauth the money she has requested – though one openly worries about costs. So does Mayor Mauro. In an interview in the mayor’s office two weeks later, Mr. Mauro says that his reluctance to give the police an extra $1.1-million, in addition to the $41-million police budget, should not be construed as opposition to the OIPRD recommendations. He maintains his frustration is directed at “the ability of the agencies of the Crown” to pass judgment on the city without providing funding to fix the problems. “I realize that there are some municipalities, maybe Toronto, for whom $1.1-million is tip money. But for us, it is a relatively big component,” he says. Though, for all that, the sum is not nearly enough to follow through on Mr. McNeilly’s full list of recommendations. The most expensive item on that list – the call for all officers and employees to be trained in Indigenous culture – has been put on hold. Chief Hauth says she is unable to put a price tag on the training, but she told city councillors that she has written to the province and the federal government asking for help to pay for it. She explains in her interview with The Globe that she has not decided which type of training will work best for her department. There is a range of options, she says, and she does not want to pick one just to say the box has been ticked. As for the rest of Mr. McNeilly’s OIPRD list – beefing up the number of officers who have the professional competence to investigate serious crimes – Chief Hauth notes that her force has long been asked to do too much with too little. She says the size of her criminal-investigations branch is small compared, for example, with Sudbury or Barrie, Ontario cities that have far fewer murders and attempted murders than Thunder Bay. So far this year, three murders have occurred in Thunder Bay, two of them this week alone. A woman was found dead Tuesday morning on a local bike path; the next day, a man was beaten to death with a bat. Police have made arrests in these two cases. To many observers, though, that focus on numbers is a distraction. Thunder Bay, they point out, has the fourth-highest per-capita rate of police officers of any city in the country. There may not be many detectives here, but there are plenty of police on the streets. For her part, Chief Hauth says that she has the number of officers that she “contractually” needs on the streets; and she points, as well, to the city’s high rate of violent crime. She also mentions the large number of transient people in Thunder Bay who are not counted when determining the ratio of officers to residents. But Indigenous people say the police are simultaneously overpolicing and underserving them. Every day at Thunder Bay International Airport, 20 or so Fairchild Metroliners, Cessnas, Beeches and Dash 8s drop hundreds of passengers from such far-flung First Nation communities as Marten Falls, Fort Hope, and Webequie, and such regional hubs as Sioux Lookout and Red Lake. Students come here to attend high school. Children and teens who have been traumatized at home, sometimes by the suicide of a loved one or through abuse by a community member, are sent here for counselling. People with cancer, heart disease and other major ailments travel for treatment. About 121,000 people live in Thunder Bay and the surrounding region, roughly 15,000 of whom are Indigenous; about 800 people live on Fort William First Nation, which abuts the city at its southern end. Thunder Bay’s Italian population is about the same size as the Indigenous population. The Finns came here to log in the 1870s. Thunder Bay is home to the biggest Finnish community outside of Finland. The region’s roots, of course, run much deeper. Thunder Bay began as a fur-trading outpost on Ojibwa territory in the 17th century. Over centuries, Indigenous people and settlers came to inhabit the same land, the Ojibwa eventually relegated to reserves, where many remain to this day. Hers is a common observation here – although it is often made with a darker spin. Alongside the costs that taxpayers themselves incur, say some citizens, they are being asked to pay for the policing of people who don’t share the economic burden of providing those services. Although there is some perfunctory griping that such outsiders include Lakehead University’s 7,800 students, the resentment is overwhelmingly directed at people visiting from First Nation communities. In even murkier corners of the population, there is also outright skepticism that Indigenous victims found dead in local waterways have, in fact, been the victims of crime. Some non-Indigenous people have told The Globe that First Nations kids simply get drunk and then roll into the water. Echoing the sentiments of Ms. Sawdo, some Indigenous people say there are two cities here. And they say that city hall – despite its Aboriginal-liaison unit, established to create relationships with Indigenous residents; and its public-relations campaigns aimed at educating non-First Nations people about the Indigenous reality – is part of white Thunder Bay. The other Thunder Bay, they say, is out there on the streets and in the malls, at the hospital and in the high schools. It is where drugstores reward employees for following Indigenous customers until they have paid for their purchases, and where security guards slam Indigenous youth to the floor when they resist arrest for suspicious activity. It is in that Thunder Bay that Barbara Kentner, an Ojibwa woman out walking with her sister in January, 2017, was hit with a trailer hitch thrown from a passing car as someone in the vehicle yelled, “Yeah, I got one of them.” Ms. Kentner died six months later, and her alleged killer has been ordered to stand trial. Sharon Johnson’s little sister, Sandra, was 18 when she left Ms. Johnson’s apartment for a late-night walk in February, 1992, to see a cousin on the other side of town. Her naked body was found the next day on the frozen surface of the Neebing-McIntyre Floodway. “She was vulnerable, she was young,” recalls Ms. Johnson, a soft-spoken and reflective woman. It took Ms. Johnson more than a decade to join a group of activists who had been complaining for years about unsolved crimes. These days, she organizes walks to bring comfort to the families of the victims – to let them know they are not alone. When the time comes for the vote in the chambers at city hall that late-January night, the city politicians take a stand of their own: When the vote is called, all 12 regular councillors agree to give Ms. Hauth the money she has requested. It is a near-unanimous decision of city council – but for a single holdout. Amid their talk of the need to reduce crime and to improve their city’s reputation, Mayor Mauro quietly leaves his seat and disappears from the room. He does not return for the vote. During the interview in his office two weeks later, he frames his reluctance to give the police the additional $1.1-million as being rooted in his dismay that outside forces are effectively dictating how his city’s municipal budget must be spent. And although the city must begin scrubbing one corner of that stain, Mayor Mauro clearly feels the effort to effect change in the relationship with Indigenous people is not one of his priorities at city hall. She is moving ahead with the OIPRD recommendations, and she says that her force has been making changes – including increasing the size of her investigations branch by three officers – ever since Mr. McNeilly announced that he was conducting a review. Since city hall approved the increase to her budget, she adds, she has arranged for additional spaces at the provincial police college, which will ultimately give her the room to move five more people from front-line positions and into her investigations branch. The process for purchasing cameras is also under way, and there is a conversation taking place about how to better share information with other forces. The police clothing committee, meanwhile, is pricing name tags. Finally, she adds, the city’s police, the coroners and pathologists have been meeting to determine which investigations will be reopened. Mayor Bill Mauro says it’s ‘nonsense’ to say he doesn’t see the racism in Thunder Bay, adding that it's not unique to the city. ‘We’re dealing with a generational situation. The country is dealing with it,’ he says. If there is going to be a change in Thunder Bay, if the elusive concept of reconciliation between the Indigenous and non-Indigenous populations is going to take place, it will start with the persistent actions of a few common people doing uncommon things. At an earlier city-council meeting this year, on another cold January night, councillors were greeted by a rally of about 100 people who had arrived at City Hall to express support for the Indigenous community. His understanding of the Indigenous experience did not come overnight, he says; it arrived slowly, over time. He remembers, for instance, walking home one night as a young man after having too much to drink. Alvin Fiddler, the Grand Chief of Nishnawbe Aski Nation, a political organization representing 49 First Nation communities in Northern Ontario, is happy that the racism he and others have been calling out for decades has been publicly and officially exposed in the clear language of multiple reports. Ms. Hauth, the police chief, talks with Alvin Fiddler, Grand Chief of the Nishnawbe Aski Nation. Ms. Sawdo, the human-resources expert born and raised in Thunder Bay, was one of three Indigenous people on an eight-person committee struck last April to help the police address the issues that would later be spelled out in the report of the Office of the Independent Police Review Director. Five of the committee members worked for the police force. The committee met for months without bridging the divisions between members. Things started to sink in. The committee members also watched a video of an Australian Aboriginal woman talking about racism in her society and who said that Indigenous people have, for too long, stood on the sidelines as non-Indigenous legislators made decisions about their lives. “The woman on the video said, ‘You need to shut up and let us speak on our own behalf,’ ” Ms. Sawdo recalls. Then the committee took part in a sweat lodge, the ceremonial safe place of prayer in which fire, water, medicines and other elements are used for healing. Slowly, Ms. Sawdo says, attitudes began to change. Several members of the committee acknowledged to her that, despite their good intentions, they had not realized they had been controlling the conversation rather than allowing Indigenous people the space to decide how things should move forward. If members of that committee can be made to understand the issues, Ms. Sawdo says, so can the people of Thunder Bay. Editor’s note: March 27, 2019: An earlier version of this article incorrectly suggested Kathleen Wynne was Premier when Bill Mauro was elected Liberal MPP. This version has been corrected. 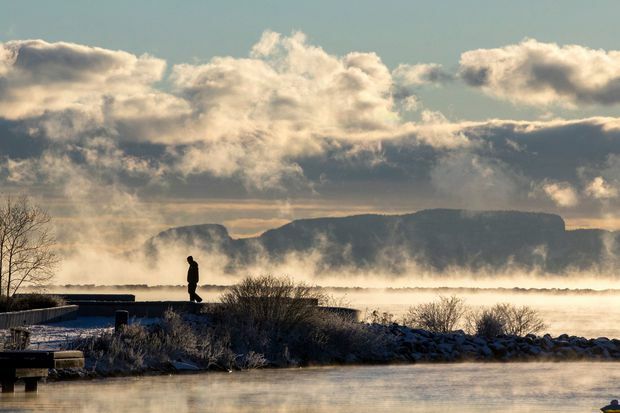 The sun rises behind the Sleeping Giant in Thunder Bay.